There are several kinds of tea infusers. These are usually made from a metal cage, which comes in two parts and is fastened together. Sometimes they have larger holes in their metal cases, sometimes they are meshed based. The mesh ones comes in several sizes. The regular sized ones and the metal novelty ones are great for smaller whole leaf teas, but not good for oolongs, large leaf teas, or rooibos. The larger sized mesh balls are are good for the larger leaf teas, oolongs and white teas. 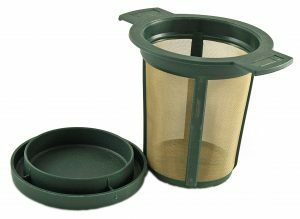 Basket type infusers can be used with any kind of tea (our Tea Infuser can even brew coffee!) can be used in mugs, cups, pots and glasses. 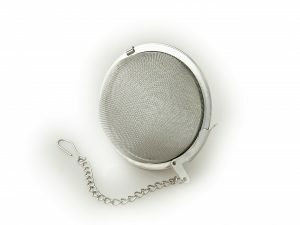 They are particularly easy to use and clean, go through the dishwasher and if you are not keen on plastic we have a stainless steel version and a silicone collapsible one which is great for travelling (though it is not great for rooibos or very small tea leaves). There is also a wide range of novelty infusers From robots, to hippos to Ninjas.